Having saturated rural and suburban markets and losing market share for the first time in its history, Walmart is spending millions to break into urban markets like New York City in order to continue growing. 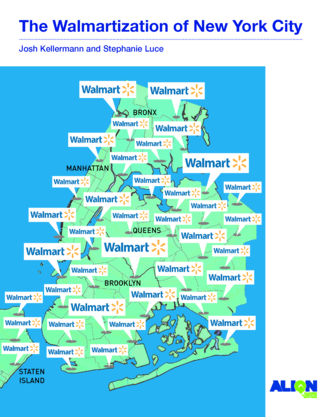 But what would be the costs to NYC of Walmart’s continued growth? This report by ALIGN’s Josh Kellermann and CUNY’s Stephanie Luce suggests that Walmart’s likely plans for expansion in NYC would dramatically shift the city’s entire retail landscape for the worse. In order to achieve its average 21% market share, Walmart would need to open 159 stores throughout all 5 boroughs, creating devastating effects for local small businesses, communities and workers.